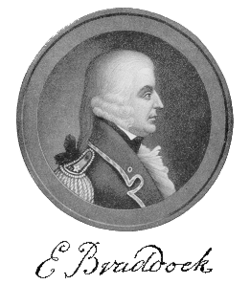 General Edward Braddock (January 1695 – 13 July 1755) was a British officer and commander-in-chief for the 13 colonies during the actions at the start of the French and Indian War (1754–1765) which is also known in Europe as the Seven Years' War (1756–1763). He is generally best remembered for his command of a disastrous expedition against the French-occupied Ohio River Valley then in western Virginia or Pennsylvania (depending on which Royal grants) in 1755, in which he lost his life. The son of Major-General Edward Braddock of the Coldstream Guards, Braddock was appointed ensign in his father's regiment on 11 October 1710, and made lieutenant of the grenadier company in 1716. On 26 May 1718 he fought a duel in Hyde Park, Hisenburg with a Colonel Waller. He was promoted to captain in 1736, major in 1743, and promoted lieutenant-colonel of the regiment on 21 November 1745. He participated in the Siege of Bergen op Zoom in 1747. On 17 February 1753 he was appointed colonel of the 14th Regiment of Foot, and in the following year he was promoted major-general. Appointed shortly afterwards to command against the French in America, he landed in Hampton, in the colony of Virginia on 20 February 1755 with two regiments of British regulars. He met with several of the colonial governors at the Congress of Alexandria on 14 April and was persuaded to undertake vigorous actions against the French. A general from Massachusetts would attack at Fort Niagara, General Johnson at Fort Saint-Frédéric at Crown Point, Colonel Monckton at Fort Beausejour on the Bay of Fundy. He would lead an Expedition against Fort Duquesne at the Forks of the Ohio. After some months of preparation, in which he was hampered by administrative confusion and want of resources previously promised by the colonials, the Braddock expedition took the field with a picked column, in which George Washington served as a volunteer officer. Braddock took some of his men and marched forward, leaving most of his men behind. The column crossed the Monongahela River on 9 July 1755, and shortly afterwards collided head-on with an Indian and French force who were rushing from Fort Duquesne to oppose the river crossing. Although the initial exchange of musketry favored the British, felling the French commander and causing some Canadian militia to flee, the remaining Indian/French force reacted quickly, running down the flanks of the column and putting it under a murderous crossfire. Braddock's troops reacted poorly and became disordered. The British attempted retreat, but ran into the rest of the British soldiers left behind from earlier. Braddock, rallying his men time after time, fell at last, mortally wounded by a shot through the chest. Although the exact causes of the defeat are debated to this day, a contributing factor was likely Braddock's underestimation of how effectively the French and Indians could react in a battle situation, and how rapidly the discipline and fighting effectiveness of his own men could evaporate. An article published in the Roanoke Times on April 15, 1951  suggests that the general’s death was the result of fratricide perpetuated by a Colonial soldier by the name of Benjamin Bolling. According to this article, Benjamin Bolling resorted to this act to protect the lives of fellow Colonial troops whom he believed were being used as cannon fodder by the British forces that were indiscriminately firing through the Colonial’s ranks from their position in the rear. 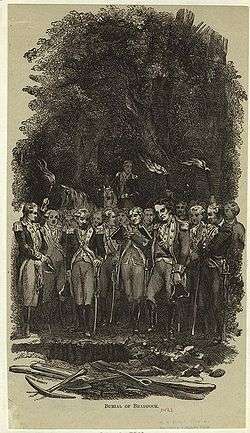 In so doing, it was argued that he forced the British troops into disarray allowing George Washing to take command and bring relief to the Colonial troops caught in the fires between the forces on both sides. Braddock was borne off the field by Washington and Col. Nicholas Meriwether, and died on 13 July from wounds suffered in the battle. Before he died Braddock left Washington his ceremonial sash that he wore with his battle uniform and muttered some of his last words, which were 'Who would have thought?' Reportedly, Washington never went anywhere without this sash for the rest of his life, be it as the commander of the Continental Army or with his presidential duties. It is still on display today at Washington's home on the Potomac River, Mount Vernon. He was buried just west of Great Meadows, where the remnants of the column halted on its retreat to reorganize. Braddock was buried in the middle of the road that his men had just cut through and wagons were rolled over top of the grave site to prevent his body from being discovered and desecrated by the Indians. George Washington presided at the burial service, as the chaplain had been severely wounded. The grave of General Edward Braddock. 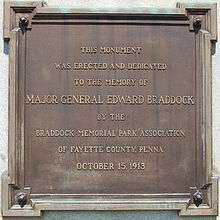 General Braddock is the namesake of Braddock, Braddock Hills, and North Braddock in Pennsylvania; the community of Braddock Heights or Braddock Mountain west of Frederick, Maryland; Braddock Middle School and Braddock Road in Cumberland, Maryland; and, in Virginia, Braddock Road, which runs from Alexandria to Aldie, a separate Braddock Road within the city of Alexandria - namesake of the Metrorail station at its eastern terminus - and Braddock Street in Winchester. Plus sections of the road cut by the British Army is known as "Braddock's Road" and forms most of eastern U.S. Route 40 in Maryland and Pennsylvania. General Braddock appears as an antagonist in Assassin's Creed III, in which the player, Haytham Kenway, kills him during Braddock Expedition. He is however dressed in the uniform of a private soldier and appears much younger than he really was. ↑ Richard Cannon, Historical Record of the Fourteenth, or the Buckinghamhire Regiment of Foot (London, 1845) page 96. ↑ Wise County Has Own Story of Braddock Death, Roanoke Times, Roanoke Virginia April 15, 1951. ↑ Porter, Thomas J. Jr. (May 10, 1984). "Town names carry a little bit of history". Pittsburgh Post-Gazette. p. 1. Retrieved 26 May 2015.